This is the charity version of a vending machine route. Honor boxes come in both corrugated box configurations, as well as plastic towers. Both are filled with candy or snacks, along with a suggested donation amount for each item – usually $1. The corrugated box variety offered by www.SheridanSystems.com and others, can be placed in company or small office kitchens and break rooms. When employees take their breaks, they can choose one of the snacks from your assortment and put the minimum donation amount in the box. 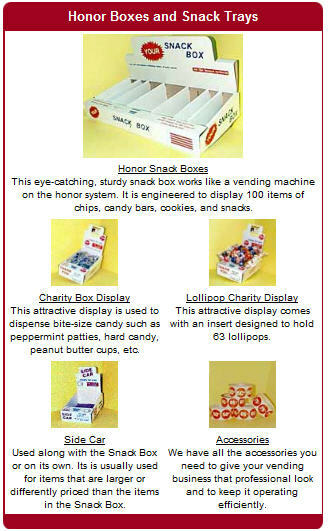 Another version of the honor box is a clear acrylic candy dispenser that has a donation box fitted on top. This is usually designed for the bags of small candy samples or mints that you see in most stores. These are sometimes placed in the same areas recommended in the write-up in the Donation Boxes section of this book. These are more costly than the corrugated cardboard honor boxes. You can see samples of this type of honor box at www.CoolPlastic.com. Source of Idea: The first honor box study (see footnote referenced in this write-up) spanned a 12-year period from 1993 to 2004. “Freakonomics” attributed the honor box to a research analyst named Paul F. who grew a large bagel business to 140 companies after a work cut-back, and still operates it today. He’s delivered more than 1.3 million bagels.